Please note: The following case is used here, with permission. It is not to be reproduced or republished without written permission. This case is from the Henry McKay UFO Archives and involves a UFO landing in a field of tobacco plants, as well as a greenish-blue residue found at the site. The incident was investigated by pioneer physical trace ufologist Henry McKay. The late Henry McKay (1927-2007) was the first director of MUFON Canada and also investigated for CUFOS (headed by Dr. J. Allen Hynek), NICAP (headed by Maj. Donald Keyhoe of the U.S. Marines), APRO (headed by Jim and Coral Lorenzen), and many others. He also served in the Air Force. On Sunday, July 6, 1975, at approximately 4:30 or 5:00 P.M., a tobacco farmer by the name of Joe Borda observed a silver domed-shaped UFO in his field of tobacco plants in Mount Pleasant, Ontario, Canada. The object was approximately 400 yards away from where he was standing and Borda assumed it was just a neighbour’s stainless-steel irrigation truck or tank. It was later reported that none of the neighbours had their work vehicles out that day. Two days later, on July 8, Borda found a circular-like depression, approximately 20-30 feet in diameter, of damaged tobacco plants at the spot where the object was seen two days earlier. Some of the leaves from the tobacco plants within the depression were burnt brown. Other tobacco plants within the depression were flattened, and some were found broken at the stem. A greenish-blue oily residue was also found among the damaged tobacco plants. Samples from the site were collected by the county’s Crown Attorney, Charles Borda, who was also Joe Borda’s brother. Charles handed the samples over to the Brantford detachment of the O.P.P. (Ontario Provincial Police) who in turn sent them to the Centre of Forensic Sciences in Toronto for lab testing. By the time pioneer ufologist Henry McKay arrived on the scene, every trace of the greenish-blue residue was removed by police. Henry later contacted the Brantford detachment of the O.P.P. to obtain the results of the lab tests conducted on the samples by Forensic Sciences. 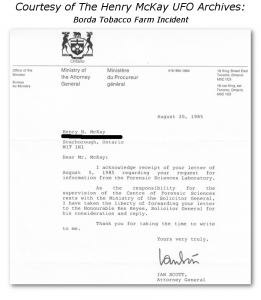 In a letter to Henry from the Brantford detachment of the O.P.P., dated August 12, 1975, it states they were informed by Forensic Sciences that “the tobacco samples appear to have been struck by lightning”. Not fully buying into the lightning explanation, Henry asked the Brantford detachment of the O.P.P. for a copy of the Forensic lab results. They told Henry he would need to contact the Centre of Forensic Sciences. Henry tried relentlessly for over ten years to get a copy of the Forensic lab results from various Canadian government agencies who kept referring him back and forth between agencies: Centre of Forensic Sciences, the Canadian Department of National Defence, the Office of the Premier (Ontario), the Attorney General of Ontario, members of parliament, the Solicitor General, and others. If this was just a simple case of tobacco plants struck by lightning then surely there should have been no issue with releasing the report — especially considering that the property owner (Joe Borda) and the Crown Attorney (Charles Borda) gave full permission to Henry to gain access to the report. Charles also tried on his own, as Crown Attorney, to get a copy of the Forensic lab results and not even he could gain access to the report. 40 years later, in 2015, ufologist Bob Mitchell, a well-respected retired Toronto Star journalist and executive for MUFON Canada, attempted to carry the torch for Henry’s quest of obtaining a copy of the lab results after Henry passed away. Mitchell contacted the Forensic Science Centre in Toronto, the O.P.P., the Canadian National Research Council, and the R.C.M.P. (Royal Canadian Mounted Police). According to Mitchell, none of them had information about the incident ever happening. 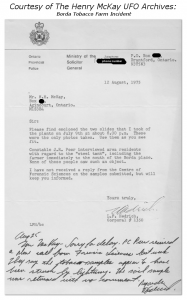 Fortunately, The Henry McKay UFO Archives has a letter dated August 12, 1975, from local police indicating that yes indeed the Borda samples were analyzed by Forensic Sciences. A digitized copy of this letter, along with another letter and a sketch by Borda, have been released to Black Vault. If anybody can provide any further information on this case please contact The Henry McKay UFO Archives. For what it’s worth, it should also be noted that according to the book titled, “Gateway to Oblivion”, by Hugh Cochrane, three unknown men barged their way onto the Borda property in a limousine with Arizona license plates. They apparently drove straight to the damaged area, knowing exactly where they were going without any direction from Borda, and took samples of the damaged tobacco plants. When Borda went out to his field to question them they reportedly told him that it was none of his business and to go away. In 2015, Mitchell visited the area to research the case 40 years later and spoke to one of Joe Borda’s descendants. Mitchell told The Henry McKay UFO Archives that during his research he discovered that the limousine with the Arizona license plates arrived a few hours before Borda even notified police.